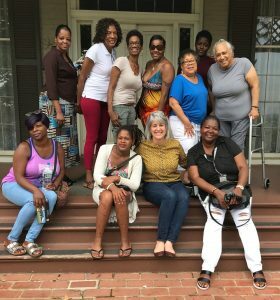 Last week, the women at Calvary enjoyed a fun and educational visit to Frederick Douglass National Historic Site in Historic Anacostia. The site preserves the home of Frederick Douglass (1818 – 1895), the African-American civil rights leader, abolitionist, women’s suffrage supporter and advisor to president Lincoln. The well-maintained site made for a wonderful trip, as women got an informative and lively tour of the house where Frederick Douglass lived for nearly 20 years. The group admired elaborate wallpaper patterns throughout the house and asked many interesting questions about 19th century kitchen equipment. Since the house is situated on a hill, the front porch offers a beautiful view of the DC skyline that everyone enjoyed. After the tour, the women watched a short movie learning more about Douglass’ life before and after he escaped slavery, his family affairs, and political activities. Inspired by what they saw, women then browsed the visitor center bookstore looking for further resources. What a great way to explore our own neighborhood’s fascinating history!